Many people depend on the caffeine in coffee, soft drinks (for example, colas), or tea to wake them up in the morning or to keep them awake. Certain commonly used prescription and over-the-counter medicines contain ingredients that can keep you awake. These ingredients include decongestants and steroids. Many pain relievers taken by headache sufferers contain caffeine. Heart and blood pressure medications known as “beta blockers” can cause difficulty falling asleep and increase the number of awakenings during the night. People who have chronic asthma or bronchitis also have more problems falling asleep and staying asleep than healthy people, either because of their breathing difficulties or because of the medicines they take. Other chronic painful or uncomfortable conditions—such as arthritis, congestive heart failure, and sickle cell anemia—can disrupt sleep, too. Nicotine is can keep you awake. Nicotine also leads to lighter than normal sleep. Heavy smokers also tend to wake up too early because of nicotine withdrawal. Although alcohol is a sedative that makes it easier to fall asleep, it prevents deep sleep and REM sleep, allowing only the lighter stages of sleep. Caffeine is thought to block the cell receptors that adenosine uses to trigger its sleep inducing signals. In this way, caffeine fools the body into thinking it isn’t tired. It can take as long as 6–8 hours for the effects of caffeine to wear off completely. Drinking a cup of coffee in the late afternoon consequently may prevent your falling asleep at night. People who drink alcohol also tend to wake up in the middle of the night when the effects of an alcoholic “nightcap” wear off. Menstrual cycle hormones can affect how well women sleep. Progesterone is known to induce sleep and circulates in greater concentrations in the second half of the menstrual cycle. For this reason, women may sleep better during this phase of their menstrual cycle, but many women report trouble sleeping the night before their menstrual bleeding starts. This sleep disruption is probably related to the abrupt drop in progesterone levels in their bodies just before they begin to bleed. Women in their late forties and early fifties, however, report more difficulties sleeping (insomnia) than younger women. These difficulties may be because, as they near or enter menopause, they have lower concentrations of progesterone. Hot flashes in women of this age also may cause sleep disruption and difficulties. A number of psychological disorders—including schizophrenia, bipolar disorder, and anxiety disorders—are well known for disrupting sleep. Depression often leads to insomnia, and insomnia can cause depression. Some of these psychological disorders are more likely to disrupt REM sleep. Psychological stress also takes its toll on sleep, making it more difficult to fall asleep or stay asleep. People who feel stressed also tend to spend less time in deep sleep and REM sleep. 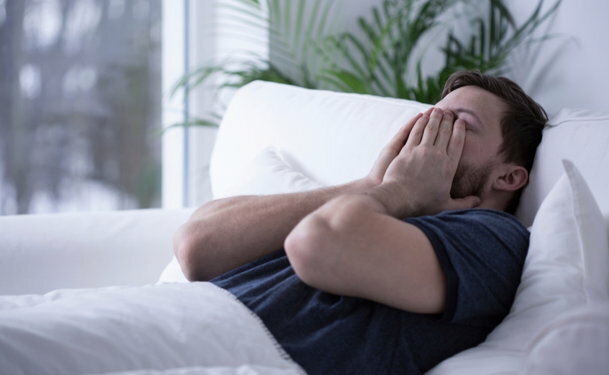 Many people report having difficulties sleeping if, for example, they have recently lost a loved one, are undergoing a divorce, or are under stress at work. Sleeping environment also can affect your sleep. Clear your bedroom of any potential sleep distractions, such as noises, bright lights, a television, or computer. Having a comfortable mattress and pillow can help promote a good night’s sleep. You also sleep better if the temperature in your bedroom is kept on the cool side. Certain lifestyle factors may also deprive a person of needed sleep. Large meals or exercise just before bedtime can make it harder to fall asleep. Studies show that exercise in the evening delays the extra release of melatonin at night that helps the body fall asleep. Exercise in the daytime, on the other hand, is linked to improved nighttime sleep. If you aren’t getting enough sleep or aren’t falling asleep early enough, you may be over scheduling activities that can prevent you from getting the quiet relaxation time you need to prepare for sleep. Most people report that it’s easier to fall asleep if they have time to wind down into a less active state before sleeping. Relaxing in a hot bath before bedtime may help. In addition, your body temperature drops after a hot bath in a way that mimics, in part, what happens as you fall asleep? Probably for both these reasons, many people report that they fall asleep more easily after a hot bath.